Jake Wagner talks with his attorneys following an early April pretrial hearing in a Pike County courtroom. A status hearing set for early Tuesday morning in the ongoing legal proceedings against multiple murder suspect Edward “Jake” Wagner was indefinitely postponed. Wagner is one of six members of his family charged directly or indirectly with participating in the infamous murders of eight members of the Rhoden family in Pike County in 2016. No reason was publicly given for the postponement and according to an official of the Pike County Court of Common Pleas, no new date has been set for the hearing. Pike County Prosecutor Rob Junk was not immediately available for comment regarding the postponed hearing Tuesday morning. In any case, Junk may have been unwilling or unable to talk to the media as Common Pleas Judge Randy Deering, who is presiding over the Rhoden murder cases, has long since imposed a gag order blocking anyone directly connected with the court proceedings from speaking with reporters. As of early Tuesday afternoon, the Common Pleas court website still listed Tuesday as the date for the conference hearing. Status conferences in criminal proceedings generally involve discussions amongst the attorneys for both the defense and prosecution as well as the presiding judge in an attempt to determine the progress and direction of the case, often focusing on various evidentiary issues or pretrial motions. Such hearings generally are open to the public as Tuesday’s hearing would have been. In this instance, with the agreement of defense attorneys, Wagner would not have been present at the hearing Tuesday. His attorneys indicated they would advise their client regarding the happenings at the status hearing at a later date. Barring any further scheduling changes, Wagner will need to be back in court for his fourth pretrial hearing scheduled for May 14. The case against Edward Wagner may prove key to the prosecution in all of the Rhoden murders. Prior to the imposition of Deering’s gag order, then state Attorney General Mike DeWine told the media at a press conference announcing the arrests of the various members of the Wagner family, a custody battle over the child of Edward Wagner and murder victim Hanna Rhoden, who was 19 at the time of her death, may be at the heart of the motive for the murders. 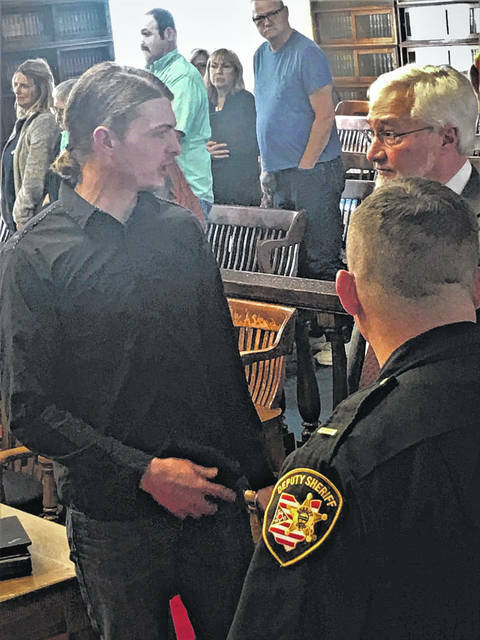 https://www.portsmouth-dailytimes.com/wp-content/uploads/sites/28/2019/04/web1_jake-2a-1.jpgJake Wagner talks with his attorneys following an early April pretrial hearing in a Pike County courtroom.